The January retail sales and ebay are the time to be picking up bargains, particularly style pieces that are not trend led and will re-emerge season after season. I spotted this one on Ebay earlier this week and its by Miss Selfridge. 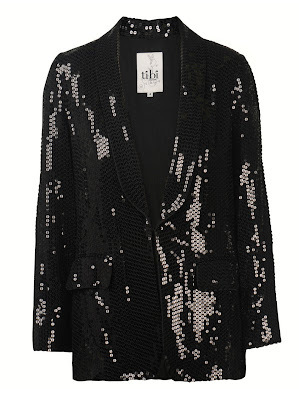 Have you a sequin piece in your wardrobe that is a favourite? Hope you all have a very nice weekend! I also have a sequin jacket, it is silver though. I like to bring it out during the day and dress it down with jeans and flats. Great find on ebay though. Such a super find! U are the best! What a great "fix" this jacket is! And at such a great price! LOVE it! It will spice up many an outfit. I don't have sequines but now I wish I did! I had a Betsy Johnson 80's skirt that I wore so much that the sequins started to fall. Now I own 2 fantastic sequins purses. Dear Sharon, it's lovely! The blue sequins make it much more interesting. Great jacket, me likey - I think the electric blue touches make it even nicer. How funny, I currently also do have a post about embellishment and sequins! Sequins are sooooo perfect for an evening look, you never can go wrong with them! the blazer is so cute, very 80s! Yours is lovely and much better as it's electric blue, one of my very favourite colours. Perfect find of course! Those trousers are the best we can be twins! Your jacket *rocks*! ^_^ I love the look of electric blue sequins! I have a vintage butterfly-pattern sequin top I got from the thrift store that I adore! 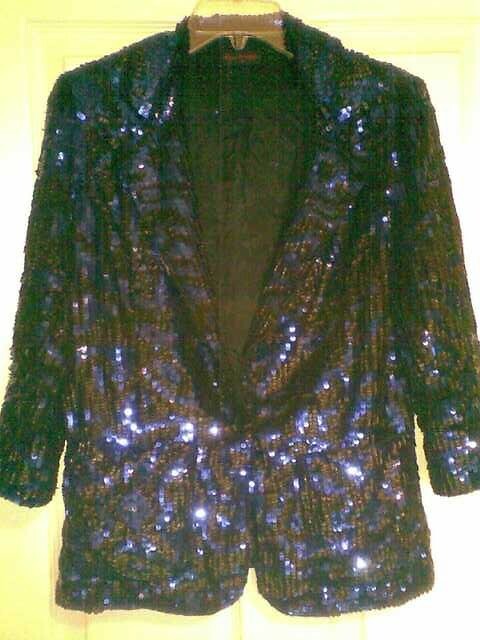 Still haven't been to a glitzy-enough occasion to wear it, but I'm hoping next year we'll get to do that. WOW!!! I love it. Going to look amazing on you. My best sequins are the sequin pants that YOU helped me pick out! !